In a test to find the finest cranberries, the best bounce highest. When John “Peg-Leg” Webb poured a load of cranberries down his storage-loft stairs (his wooden leg made it impossible to carry them), he noticed that only the firmest and the finest made it to the bottom—the bruised and spoiled lingered on the upper steps. He realized then that the fruit’s “bounceability” was the perfect test to separate the good from the bad. That was in 1880; today, a bounce test still exists—a cranberry Olympics of sorts—but instead of stairs, many farmers use something called a bounce board separator. The berry contestants are dumped into a hopper, where they face a gauntlet of angled wooden boards. Softer cranberries slouch against the slats, sliding into a box set aside for the compost heap. 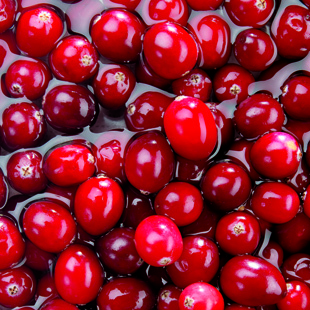 Somewhat sprightlier specimens make the cut for the juicer, while the top-shelf cranberries—the gold medal winners—catapult themselves in graceful pole-vaulting form to the conveyor belt below. Only these bouncy berries are destined for the table. So when you’re measuring those whole cranberries for our Cranberry Upside-Down Cake, know they went through quite an athletic journey to make it to your kitchen.